Loretta Lynn was born in an Appalachian coal-mining community so far from the rhinestones of Nashville that there wasn’t so much as a dirt road for getting down the mountain. People entered Butcher Holler, Kentucky, by way of a footpath, and they almost never left. 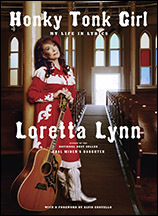 Loretta did, of course—an exit she credits to her late husband, Oliver Lynn (known to the world as “Doolittle” or “Doo”), whom she married at 13. Loretta was still a teenager when Doolittle bought her a guitar because he liked the way she sang to their babies.